CHICAGO AND NEW YORK -- Ventas Inc. (NYSE: VTR) has entered into a definitive merger agreement to acquire all of the outstanding shares of American Realty Capital Healthcare Trust Inc. (NASDAQ: HCT) in a stock and cash transaction valued at $2.6 billion. The board of directors for both companies unanimously approved the agreement, which would transfer 143 properties and a pipeline of more than $250 million in potential investments to Ventas. 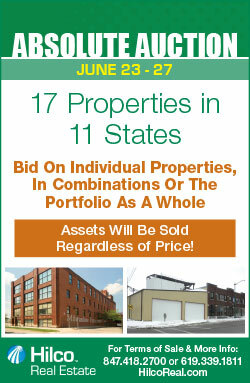 "[This transaction provides our shareholders] the opportunity to participate in the future growth of what will become the largest, and in my view, best managed healthcare REIT and sixth largest overall REIT in the country," says Nicholas Schorsch, executive chairman of ARC Healthcare, a New York-based REIT focused on acquiring and owning a portfolio of medical office buildings, seniors housing and select hospital and post-acute care properties. ARC Healthcare's portfolio consists mostly of medical office buildings (MOBs) and seniors housing assets, comprising more than 80 percent of net operating income (NOI) for the fiscal year ended Dec. 31, 2013. The properties are located in attractive markets with home values and senior growth rates higher than the U.S. average. Triple-net leased healthcare and MOB assets account for 55 percent of the ARC Healthcare portfolio NOI. The triple-net leased portfolio has an average remaining lease term of 12 years, and only 2 percent of the NOI in the triple-net leased portfolio have lease maturities before 2018. Ventas also announced that it will acquire 29 independent living seniors housing communities located in Canada from Holiday Retirement in a separate transaction for roughly $900 million in cash. The transaction is expected to close in the third quarter of 2014. Upon closing, the operations for the acquired seniors housing communities will be transitioned to Atria, which will manage a total of 173 communities for Ventas, including two unrelated communities that Ventas acquired after the first quarter. "These acquisitions are consistent with our stated strategy to be the leading owner of healthcare and senior living properties globally, and position Ventas to continue to deliver growth and consistent superior returns to our shareholders," says Debra Cafaro, chairman and CEO of Ventas, a Chicago-based REIT that owns a portfolio of 1,500 seniors housing and healthcare assets in 46 states, Washington, D.C., and Canada. "We are continuing our focus on private pay assets, expanding our industry-leading MOB footprint and international presence, and increasing our diversification while maintaining a strong credit profile and balance sheet." NEW YORK CITY -- American Realty Capital Hospitality Trust (ARC Hospitality) has entered into an agreement to acquire Equity Inns' lodging portfolio for $1.93 billion. Subsidiaries of W2007 Grace I and WNT Holdings, which are both indirectly owned by one or more Whitehall Real Estate Funds, are selling the 126-hotel, 14,934-room portfolio. The portfolio is franchised by various global hotel brands, including Hilton Hotels & Resorts, Marriott International, Hyatt Hotels and InterContinential Hotels Group, and includes numerous well-known hotel flags, including Hampton Inn, Hilton Garden Inn, Homewood Suites, Embassy Suites, Courtyard, Residence Inn, Hyatt Place and Holiday Inn. When complete, the acquisition will increase ARC Hospitality's portfolio to 132 hotels totaling 16,115 rooms. Closing of the acquisition is subject to customary franchisor and lender approvals, and the deal is expected to close in the fourth quarter of this year. RCS Capital acted as financial advisor to the buyer, while Goldman Sachs & Co. and Deutsche Bank Securities advised the sellers. It is anticipated that Deutsche Bank Securities and Goldman Sachs & Co. will provide financing in connection with the acquisition. Developed and owned by Northland Investment Corp., the 269-unit Moody & Main is scheduled to open its first phase of apartments in summer 2015. WALTHAM, MASS. -- PCCP LLC has provided a $98 million construction loan for the development of Moody & Main, a transit-oriented multifamily project in Waltham. Located at the intersection of Moody and Main streets, the property will offer 269 residential units, 27,595 square feet of ground-floor retail space, a rooftop deck and an outdoor patio/courtyard area, as well as a fitness center, library, game room and clubroom. Additionally, the apartment units will feature washer/dryers, dishwashers, walk-in closets, stainless steel appliances, European-style cabinetry and solid-stone countertops. The property is located within minutes of the I-95/Route 128 office corridor and is a one-block walk from the Waltham MBTA commuter rail station and bus stop. Developed and owned by Northland Investment Corp., the property's first phase of apartments is slated for occupancy in summer 2015. Delshah Capital and On The Level Enterprises plan to redevelop the property into a multifamily building. NEW YORK CITY -- Delshah Capital has acquired 221 West 17th Street, a loft warehouse building in Chelsea, from Doreen Interiors for $26.4 million. Along with its development partner, On The Level Enterprises, Delshah plans to redevelop the 33,000-square-foot property into a residential condominium building with ground-floor retail space. The redevelopment will include the addition of four floors to create a 10-story multifamily property. MOON TOWNSHIP, PA. -- Homewood Suites by Hilton has opened Homewood Suites by Hilton Pittsburgh Airport/Robinson Mall Area. It is the company's second hotel in the Pittsburgh area. Located at 2000 GSK Drive in Moon Township, the four-story hotel features 117 suites with fully equipped kitchens, and separate living and sleeping spaces. The property is located minutes from Pittsburgh International Airport and downtown Pittsburgh. Concord Moon Associates LP owns the hotel, which is managed by Concord Hospitality. NEW YORK CITY -- Brookfield Logistics Properties has created a new brand for its $3.5 billion global logistics property platform. The new brand, IDI Gazeley, is a consolidation of Brookfield's logistic assets -- Industrial Development International (IDI) and Gazeley. IDI Gazeley is part of Brookfield Logistics Properties, and all IDI and Gazeley sites will be rebranded as IDI Gazeley. 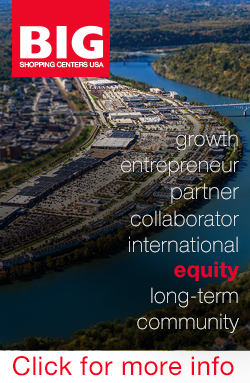 Brookfield and its institutional partners acquired IDI through two transactions in December 2012 and August 2013. Additionally, the company acquired Gazeley in June 2013. The new brand will collectively own and operate a global industrial portfolio of approximately 58 million square feet across nine countries: the United States, Canada, United Kingdom, France, Germany, Italy, Spain, Mexico and China. IDI Gazeley also has an additional 68 million square feet of distribution facilities in the pipeline, with 17 million square feet scheduled for 2014. 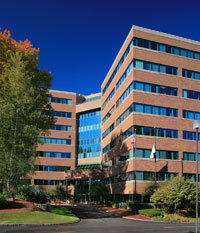 Ferncroft Corporate Center is occupied by SAS Institute, Morgan Stanley and Appleseeds. MIDDLETON, MASS. -- New York-based Sovereign Partners hasacquired Ferncroft Corporate Center, which is located at 35 Village Road in Middleton. The Davis Companies (TDC) sold the Class A office building for $24.3 million. The eight-story, 230,554-square-foot building was a former headquarters facility for Verizon. TDC originally acquired the property in early 2011 from Miami-based LNR Partners, and completed significant upgrades and renovations throughout the building following the acquisition. The tenant roster now includes SAS Institute, Morgan Stanley and Appleseeds. 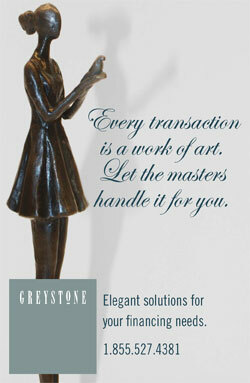 David Pergola and Brian Doherty of Cassidy Turley represented TDC in the transaction. NEW YORK CITY -- Kalmon Dolgin Affiliates has arranged the sale of 49 Dupont Street, a 100,000-square-foot property located in the Greenpoint district of Brooklyn. Dupont Street Realty LLC purchased the property from 49 Dupont Realty Corp. for $23.3 million. The buyer plans to develop the currently vacant property into a 400-unit residential apartment building with 200 parking spaces.The property offers 230,000 buildable square feet and views of the Greenpoint waterfront. Berel Nagel of Kalmon Dolgin Affiliates represented both the buyer and seller in the transaction. 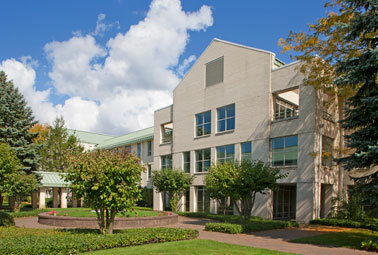 two buildings at Thornwood Conference Center in Thornwood, N.Y.
THORNWOOD, N.Y. -- CBRE Group's Westchester/Connecticut office has brokered the sale of two buildings and 97 acres at Thornwood Conference Center in Thornwood. Legion of Christ Inc. sold the assets to EF Academy International Boarding Schools for an undisclosed price. The buyer plans to use the site to expand its main campus in Tarrytown, N.Y. The two buildings total 410,000 square feet and feature a full-service cafeteria and dining room, 300-seat auditorium and conference center, dormitory-style rooms, landscaped courtyard, indoor recreation center, tennis courts and jogging trails. 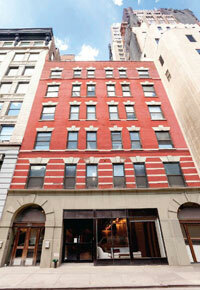 William Cuddy Jr. and Budd Wiesenberg of CBRE represented the seller in the transaction. Iron Mountain Information Management has leased the 54,000-square-foot warehouse facility in Jersey City, N.J.
JERSEY CITY, N.J. -- NAI James E. Hanson has brokered the sale of 106 Harbor Drive, a single-tenant warehouse facility in Jersey City. CenterPoint Harbor LLC acquired the 54,000-square-foot property for $4.6 million. Additionally, the new owners executed a 10-year lease for the property with Iron Mountain Information Management. 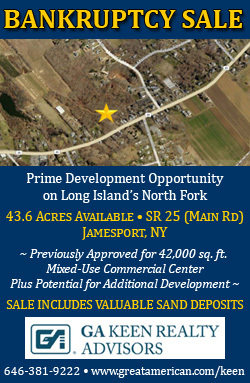 Tom Ryan and Barry Cohorsky of NAI James E. Hanson represented the seller, a family investor, in the sale. Ryan and Cohorsky also represented the new owner in the lease transaction. The six-story, 42-unit 247 Audubon Avenue in Manhattan's Hudson Heights neighborhood has been refinanced for $4.4 million. 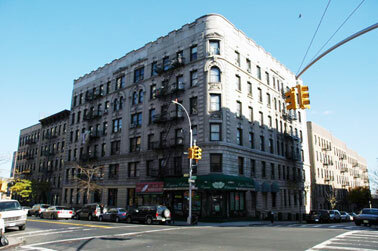 NEW YORK CITY -- Meridian Capital Group has arranged a $4.4 million refinancing loan for 247 Audubon Avenue, a six-story, 42-unit multifamily property in Manhattan's Hudson Heights neighborhood. 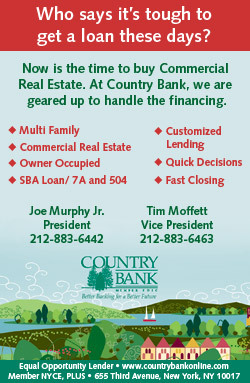 The five-year loan features a 3.25 percent fixed rate and was provided by a regional balance sheet lender. 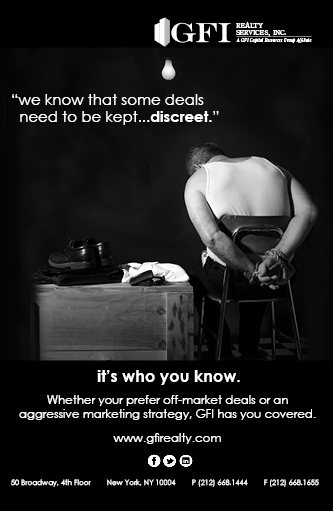 Judah Hammer of Meridian Capital Group arranged the transaction. RIDGEWOOD, N.J. -- Moonachie, N.J.-based Weiss Realty Co. has brokered the sale of 28-32 South Broad Street in Ridgewood. Chase-Properties-Ridgewood LLC purchased the 10,941-square-foot property from Willet Associates for $3.3 million. The building is currently occupied by Super Cellars and Bamboo House. Additionally, the buyer plans to open a new liquor store on the site. Matthew Weiss of Weiss Realty represented both parties in the transaction. 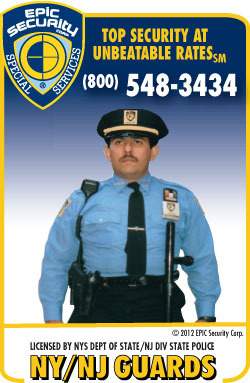 SOUTH BRUNSWICK, EDISON, SECAUCUS AND TOTOWA, N.J. -- G.S. Wilcox & Co. has arranged financing totaling $44.8 million across multiple transactions in New Jersey. Thrivent Financial for Lutherans funded two loans totaling $16.3 million for two industrial properties in South Brunswick. The company provided a $6.4 million loan for a 193,000-square-foot property and a $9.9 million loan for a 256,000-square-foot property. The loans carry an eight-year, fixed-rate term and a 20-year amortization. 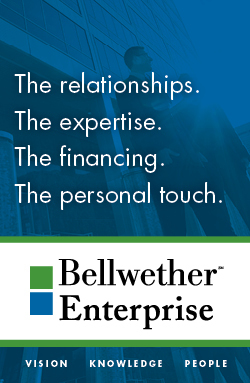 Additionally, Thrivent provided $9.4 million in refinancing for a 134,000-square-foot industrial building in Edison. The 10-year, fixed-rate loan features a 20-year amortization. Great West Financial provided a $10.5 million, seven-year, fixed-rate loan for a 170,000-square-foot warehouse in Secaucus and a $6.7 million, 10-year fixed-rate loan for a 177,000-square-foot warehouse in South Brunswick. In addition, Advantus funded a $2 million, 15-year fixed-rate loan for an 86,000-square-foot mixed-use retail/industrial property in Totowa. Gretchen Wilcox and Al Raymond of G.S. Wilcox & Co. arranged the financing for the undisclosed borrowers. NEW YORK CITY -- Advertising agency KiDS Creative LLC has signed a lease for 34,755 square feet of office space at One World Trade Center. The 15-year lease is for the entire 87th floor of the 104-story, 3 million-square-foot building. One World Trade Center is being developed as a joint venture of The Durst Organization and The Port Authority of New York and New Jersey. Durst is marketing the building along with the Cushman & Wakefield team of Tara Stacom, Alan Stein, James Searl and Justin Royce, and Jodi Pulice of JRT Realty.